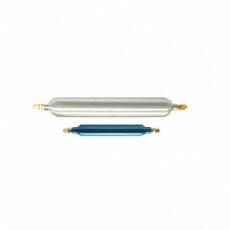 The Velocity oxygen traps are ideal for use in gas chromatography and GC/MS. These traps utilize a one-piece spun aluminium body and Swagelok™ end fittings making them pressure rated to 250 psi. Each fitting incorporates a 40 micron stainless steel frit for particulate control. These glass-bodied traps utilize a nonhazardous material that reduces oxygen levels to less than 1 ppb. This indicating adsorbent changes colour from a light green to black as it adsorbs oxygen. Either of these traps is ideal as an indicator installed down stream of s Non-Indicating Oxygen trap This allows high capacity removal of oxygen with the benefit of an indicator to alert the user of saturation of the primary trap. End fittings are nickel plated Swagelok™ with 40 micron stainless steel frits.